New Student Convocation Speaker Derick Dailey, ’11 told new Westminster College students to try laundry, love, and Langton (as in Westminster political science professor John Langton) as the strategy to be successful in both college and life in his speech at New Student Convocation on the Westminster College campus. He reminded the crowd of the great example just witnessed with the “young people like you standing together in cities and small towns across the country, reaffirming their commitment to justice and equality” in the face of the recent tragedy and hatred in Charlottesville, VA. In the final section of his talk Derick discussed how his mentor Professor John Langton had taught him how to think about what an actual situation is, what the thinker wants it to be, and how to move that case from “what is to what ought to be.” His solution was laundry and love. Dailey, who recently graduated from the Fordham University in New York City, has taken a position as an associate with the law firm of Dowd Bennett, LLP in St. Louis. 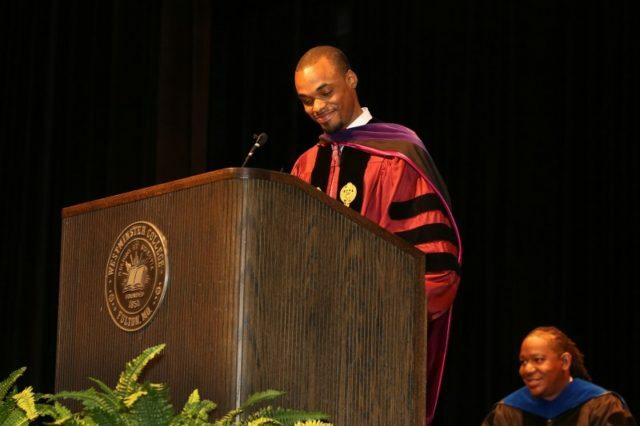 He was introduced by another of his mentors, Dr. Carolyn Perry, who received a sustained and enthusiastic standing ovation of over a minute from the crowd when it was announced she was the new Acting President of the College. 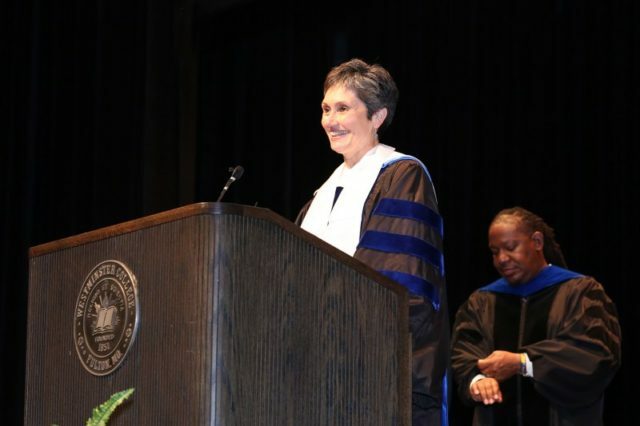 Other speakers at the Convocation ceremony included new Vice President and Dean of Student Life Bomani Spell, Interim Vice President of Enrollment and Associate Vice President and Director of International Admissions Dr. Calvin Smith, Marshal of the College and Associate Vice President and Associate Dean of Faculty Dr. David Jones and Student Body President Lydia Creech, ’19. College Chaplain Jamie Haskins gave the invocation and benediction. 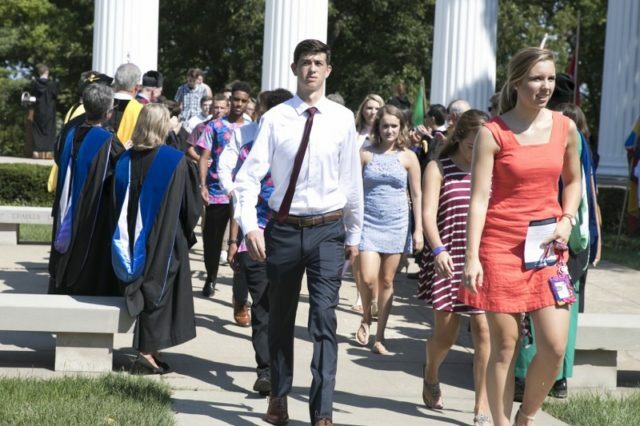 Before the Convocation ceremony, the new students officially entered campus from the outside world by walking through the historic Columns in one of the College’s most revered rites, the Columns Ceremony. Following Convocation, the new students attended a farewell reception for their parents and family members on Latshaw Plaza, had dinner with their mentors, attended a spirit rally and then socialized with their resident advisors and new classmates on The Quad. Classes begin for the new Westminster academic year Thursday, August 24. The entire Convocation ceremony can be viewed here.